416 pages | 117 B/W Illus. 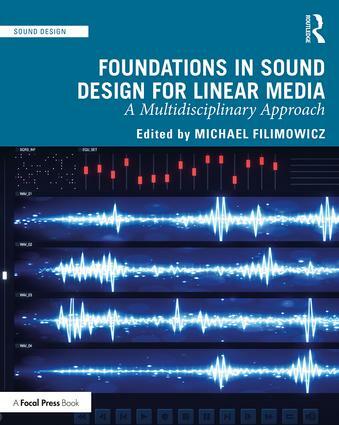 This volume provides a comprehensive introduction to foundational topics in sound design for linear media, such as listening and recording; audio postproduction; key musical concepts and forms such as harmony, conceptual sound design, electronica, soundscape, and electroacoustic composition; the audio commons; and sound’s ontology and phenomenology. The reader will gain a broad understanding of the key concepts and practices that define sound design for its use with moving images as well as important forms of composed sound. The chapters are written by international authors from diverse backgrounds who provide multidisciplinary perspectives on sound in its linear forms. The volume is designed as a textbook for students and teachers, as a handbook for researchers in sound, media and experience, and as a survey of key trends and ideas for practitioners interested in exploring the boundaries of their profession.